Rushing to deliver the final crush of holiday packages prior to Christmas, United Parcel Service is using accountants, marketers as well as other office staff to help deliver packages as the holiday peak season nears an end. UPS usually has what it calls “ready teams” or workers in its offices that help to sort, load as well as deliver packages, that it sends to clear spots were problems are across its network. The initial sign up is voluntary and usually is set weeks prior to the busiest part of the delivery season. 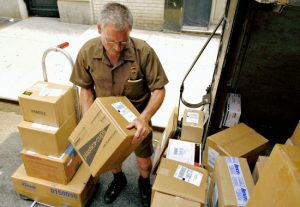 However, UPS has had to add to those workers during this holiday season by calling employees in from different desk jobs without any or very little notice. Of those called in, some have been delivering packages using their own vehicles. With a shift toward online shopping and a tight market for hiring seasonal workers, gaps were left in manpower across the UPS delivery network. A spokesperson for UPS said that several hundred office workers were assigned to different operations roles, from assisting drivers to sorting packages, over the last couple of weeks. The spokesperson acknowledged that the number had been higher than past years, but did not say how much higher. UPS, after processing record numbers of packages from its main hub in Louisville on Thursday night is in a good position to finish its deliveries schedule for pre-Christmas strong, in line with its commitments to customers. The company is planning to continue its deliveries Saturday and into Sunday if needed. If there are events that warrant it then all day Sunday packages will be delivered, said a spokesperson. UPS must react quickly to the curveballs tossed its way when it comes to the peak delivery period, when package volume daily doubles from its normal levels, in order to avoid any bottlenecks as the increase of packages moves through its network. UPS work with retailers on a close basis month prior to the rush to map out the number of orders they expect to flow and from what hubs they will likely be coming from. This year UPS started to charge extra fees for deliveries during the peak shipping days. Like with other delivery companies, including FedEx, UPS must balance its need for delivering every package on time with maintaining tight controls on its costs. Challenges this year were increased by the tighter market than usual for seasonal workers. The strong economy and low unemployment rate is shrinking the overall employee pool.